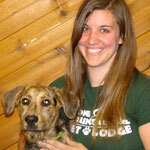 Karah started at Stone Mountain Pet Lodge in February of 2011. She received her Bachelor’s degree of Animal Science at the University of Minnesota. She has previously worked at an animal hospital. She enjoys watching the dogs grow up with us and to see all of the dog’s different personalities come out. She loves to bond with each dog and thinks that it is very important. She is pictured with her Plott Hound/German Wirehair Mix Leo..
Amber started at Stone Mountain in April of 2012. 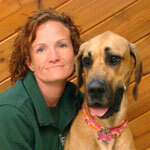 She worked as a veterinary technician for 13 years and has experience working in an emergency clinic. She also worked at a dog boarding facility on the East Coast for several years. Amber enjoys interacting with each dog and getting to know their unique personalities. She says, "I enjoy that the Doggy Day Care kids get to know us and put their trust in us on a daily basis." She is pictured with her Great Dane, Olive Oyl. Emily started at SMPL in March of 2013. Emily has been around horses all of her life and has worked closely with 4-H since Kindergarten, working her way up into leadership roles. That experience has given her many opportunities to work with all types of animals and people. Emily says her favorite thing about DDC is “Watching the dogs come out of their shell, play and have fun” She has a horse named Jackpot and a Pomeranian named Zoie. Dana started at Stone Mountain Pet Lodge in May of 2014. Dana has received her certification for Veterinary Assistant from Animal Behavior College. She has previously worked as a Vet Assistant in an animal hospital. The thing Dana says she likes the most about DDC is “Being close with the dogs and being able to interact with them every day” She is pictured here with her Bull Terrier Mix Tig.